Tanner Scheppers the Starter, Part 2? Yesterday, Drew Davison of the Star-Telegram wrote that Tanner Scheppers and the organization have a rehab path mapped out that is set to begin this week. Scheppers was, of course, the Opening Day starter after an impressive Spring Training -- and due to Yu Darvish beginning the season on the DL due to neck stiffness -- but didn't impress once the games started counting. He is scheduled to throw live batting practice on Wednesday and set out on a rehab assignment beginning Saturday. Potentially more interestingly, the organization plans to stretch Scheppers out as a starter once again, leaving open the possibility that he could once again join the rotation sometime in June. Apparently, the elbow discomfort that was bothering Scheppers was something that had bothered him dating back to Spring Training, and according to Davison, some in the organization were upset that he wasn't upfront about the issue. While I can partially understand his hesitance to mention the issue -- he was presented with the opportunity to stake claim to a rotation spot on what was thought to be a contender in 2014 -- he has assured the organization that he will be upfront and honest about his elbow during his rehab. Now, there will be those that point and scream that he's needed in the bullpen and has already proven he can't cut the mustard as a starter. To that, I say that if the elbow was really hindering him, perhaps we could see more value than we did in the four starts he made, in which he put up a 9.82 ERA. At this point, with the Rangers sitting at 21-23, the ball club is at a point at which it's still early enough in the season that things aren't over. On July 1, 2012, the Oakland A's were 38-42 and 12 games back of Texas in the AL West. Of course, Oakland ended up winning the division on the final day of the season. That year, for better parts of the season, the Rangers looked like the odds-on favorites to not only come out of the AL West, but to win the American League Championship for a third straight season. And so it is with the Oakland A's in 2014, who find themselves at 28-16, 7 full games up on the Texas Rangers, and yet we're only in the middle of May, and if you polled most fans right now, the whole thought process toes the line between blowing it all up and starting over for 2016, or getting out on the market and making a big splash for some premium talent, probably a starter and a big bat. To which I say: pump the brakes. I realize Scheppers would, if healthy, provide a hefty boost to a bullpen that has struggled to provide relief while posting an ERA of 4.40, among the worst in baseball. Yet, many of those struggles have been a result of overuse. The Texas bullpen has averaged 3.41 innings per game, the 4th-highest mark in baseball. The starting rotation has, on the whole, struggled to get through even 5 full innings, and you'd have a hard time convincing me that, if there's a chance that the Rangers could add some value on that front, that the bullpen wouldn't also benefit. If there's even a chance that adding a healthy Tanner Scheppers to the rotation, and the organization -- per Jon Daniels -- believes he has TORP potential, could provide even 1.5-2 WAR over the course of the remainder of the season, that would be a win for the organization. 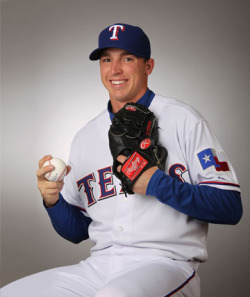 Furthermore, it very well might help curb the loss of both Martin Perez and Matt Harrison, with Derek Holland due to return hopefully sometime in June as well. Suddenly, we're talking about a rotation that maybe, just maybe, can compete without the need to go out at the deadline and acquire a starting pitcher at the high-priced cost of premium prospects. It may be a bit of a stretch to think that way, but we're at the point of the season in which dreaming and stretching for possible outcomes isn't necessarily a bad thing, and I'm 100% on board with giving Tanner Scheppers another chance in the rotation if his health was a driver of his failures previously. Furthermore, the Rangers could then turn their attention to better areas of need. And I'm not talking about a big bat. This may not be a popular way of thinking, but with this weekend's news on Prince Fielder dealing with a herniated disc in his neck, part of me sat back and realized that maybe this is a good thing. On average, Fielder's particular ailment isn't something that requires surgery. In fact, based on my findings, there's no realistic proof that surgery even helps the nerve root generate any faster, which is exactly why the Rangers gave him a nerve root injection over the weekend. Almost always, if the root can begin regenerating and the pain subsides, the patient is well on his way to recovery. If this is something that Fielder has indeed been dealing with since last season -- and it is disappointing that he told no one until recently -- then we could be looking at a scenario in which it has affected his swing at times. Again, I'm stretching just a bit, but it's not out of the realm of possibilities that if the injection helps, we could see something a bit closer to the Prince Fielder we hoped to see before the season started. Which would mean the Rangers can turn their trade deadline focus to bullpen help. Then go out and provide the Oakland A's with a taste of their 2012 medicine.